Question: Can you please describe to us what CRT is and give us a brief description of how it works? 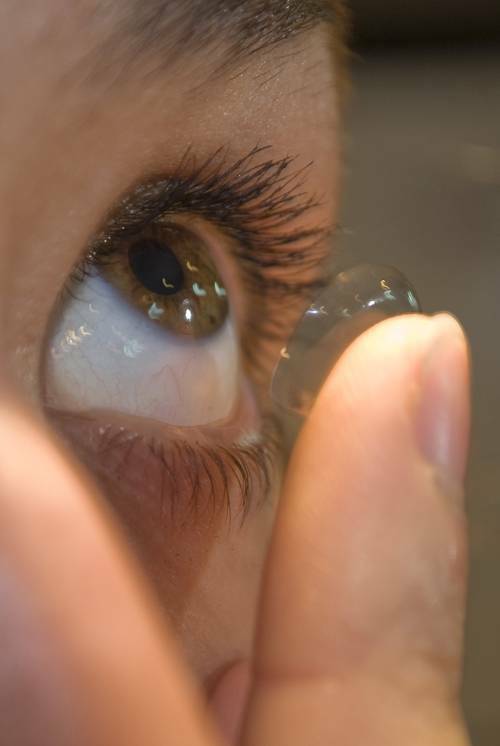 Dr. Bristol: CRT (Corneal Refractive Therapy) are contact lenses that you sleep in at night, the lenses mold and shape your cornea while you sleep. They flatten it, and by flattening the cornea the right amount, and in the right spot, in the center of the cornea, we can reduce or eliminate nearsightedness. This gives you clear distance vision. You won’t have problems seeing in the distance anymore. Enabling clear vision in the distance without wearing glasses or contacts in the daytime. The other big advantage to CRT is that by sleeping in the lenses it slows down or eliminates the development of nearsightedness. Question: Who is a good candidate for CRT and are there particular patients for whom CRT is particularly beneficial? Dr. Bristol: CRT is really great for younger people. We have very successfully fit children as young as 9 years old into CRT lenses. Younger people are usually very active in sports and water activities (either in a lake or a pool) where contacts and eyeglasses get in the way, and CRT is a great option for them. With CRT they don’t have anything in their eyes or on their face like glasses or contacts. CRT is also great for people who may be around or work in dirty, dusty environments. Since CRT slows down or eliminates the development of nearsightedness, CRT is also particularly beneficial for younger patients whose genetic history predisposes them. For instance, if we notice their prescription is going up quickly, or their parents are both nearsighted, it’s a great way to keep their prescription down to a lower amount. Question: Can you describe what the patient will experience while being treated with CRT? Dr. Bristol: There is usually some adaptation necessary. The lenses are firm and rigid and usually take some time getting used to. Most people within a week or two are very comfortable with the lenses. The vision change usually happens pretty quickly. Most people notice clear 20/20 vision within a few days to roughly a week. A big advantage to CRT is the lenses are really easy to get in. They hold their shape and won’t fold up. They are smaller than soft contact lenses also. Therefore, the insertion and removal is usually very easy. Question: You mentioned this briefly above, but can you tell us a bit more about the range of results the patients can expect to see after being treated with CRT? Dr. Bristol: We expect to attain 20/20 vision or better. With CRT lenses, if you are within the range of prescriptions which CRT can correct, we expect 20/20 vision or better. Question: What is it about this particular technology that you find most exciting, or the part of it that made you feel that it was a good fit for your practice? Dr. Bristol: We are really excited about this technology because there is what many call a myopia (nearsightedness) epidemic going on. There are more nearsighted persons now than there has ever been before. The theories why more and more people, especially younger people, are nearsighted is that it’s possibly the large amount of close-up work we do, especially at a younger age. As well as the reduced amount of time people are spending outdoors. CRT is the only technique that will help to reduce or eliminate the development of nearsightedness. If a younger person is at a risk to become nearsighted, or highly nearsighted, this is an amazing technique to keep that from happening! We thought it would be great to be able to help our patients reduce or eliminate the development of their nearsightedness. Question: Can you share a particular patient success story in which they were treated by CRT and you were able to provide a patient with a solution which they may not have otherwise been able to receive? Dr. Bristol: Sure. I have two. The first one is a younger person who just did not want to wear glasses. Absolutely did not want to wear glasses to school or around friends. Also, this child could not get in soft contact lenses. They would just fold up over and over. The child had a lot trouble and was getting really frustrated. We decided to try the CRT lenses since they are easier to insert and remove. He got the CRT lenses in and out with no problem! Within four or five days his vision was 20/20. He didn’t have to wear glasses or contacts during the day, and he slept in the CRT lenses at night. He had great vision. He could see the board at school. His mom was really worried because he didn’t want to wear glasses, and soft contact lenses just weren’t working, and CRT saved the day! Everyone was really happy in the end. Another patient story is about a swimmer. 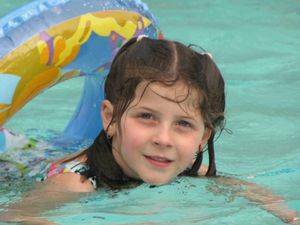 The problem was she couldn’t wear glasses while swimming, and contacts are not the best solution in a pool because of the risk of infection. We fit the patient with CRT lenses and again, everyone was happy. The patient could see clearly, 20/20 vision at the pool and also no increased risk of infection. It was a great solution. Can you please describe to us what CRT is and give us a brief description of how it works? CRT (Corneal Refractive Therapy) are contact lenses that you sleep in at night, the lenses mold and shape your cornea while you sleep. They flatten it, and by flattening the cornea the right amount, and in the right spot, in the center of the cornea, we can reduce or eliminate nearsightedness. This gives you clear distance vision. You won’t have problems seeing in the distance anymore. Enabling clear vision in the distance without wearing glasses or contacts in the daytime.